Oscar Tejeda homered in the 1st to get Potomac on the scoreboard first, then homered in the 11th off the scoreboard for the last Potomac run and a 6-5 walkoff win to complete the three-game sweep of Carolina. The HR also snapped a seven-inning scoring drought, as the P-Nats jumped out to a 5-1 lead after three innings while literally knocking out Mudcat starter Dylan Baker with a screamer back to the mound off the bat of Estarlin Martinez that bounded off what appeared to be the noggin as he crumpled in a heap by the mound. He walked off the field under his own power. Meanwhile, Hector Silvestre made his 2014 debut for the P-Nats and turned in a quality start of three runs on six hits over six innings, but all three runs came via the longball with a solo blast in the 3rd and a two-run blast in the 6th. He would walk none and strike out six without issuing a walk, and left in position to win with a 5-3 lead. Travis Henke would blow the save with two runs given up in the 7th to allow the Mudcats to tie it at 5-5. He would follow his Mr. Hyde inning with a Dr. Jekyll 8th before giving way to Jake Walsh, who pitched around baserunners in each of his three innings for htis third win in six appearances. 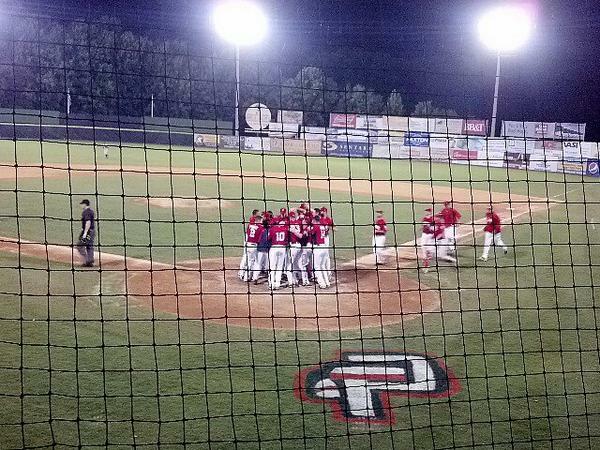 The win, which was the 13th in walkoff fashion, was also the fourth straight for Potomac. Combined with a Wilmington loss extends the P-Nats lead to two games in the C.L. North. The homestand continues with three against Myrtle Beach in a battle of the 2014 first-half champs. Dakota Bacus (3-5, 3.58) gets the ball for the P-Nats versus Chad James (1-1, 5.59) for the Pelicans. 13 walkoff wins? That’s quite a bunch for Potomac, no? Oscar just got the call and he’s going to H’burg. He’ll be with H’burg when they play tonight in Richmond. The best part of the game was the 10th and 11th innings when the announcer had no script and kept his mouth shut. Bel biv devoe. Fan club reunion look!! Given the recent releases, I’d say Syracuse.